There are 2 underground rides - The Deep Mine tour begins on Britain's steepest passenger railway (1:1.8) for a 25-minute walk through 10 "son et lumiere" sequences in an underground wonderland. 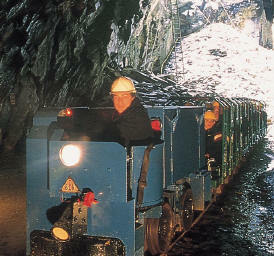 The Miner's Tramway is a guided tour through an 1846 network of awe-inspiring man-made caverns of cathedral proportions, supplemented with tableaux and demonstrations of ancient mining skills. 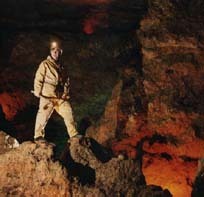 Explore the mysterious underground passages leading to an impressive Bronze Age cavern. Visitor centre with archaeological finds and artefacts. See the 1/4 full size 'Britannia', signalling, train layouts, working models. Also train rides, model shop, Buffet Coach Cafe. 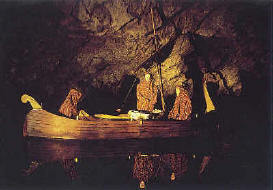 An underground boat takes visitors into spectacular caverns where Welsh tales of King Arthur are told with tableaux and stunning sound and light effects. The journey ends with a return trip along the beautiful subterranean river.